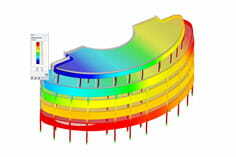 Can RFEM model a compliant composite beam with a line release using rods? Yes, this possibility exists. It is only necessary to pay attention that you initially only model a carrier and release its lines with a line release. The automatically generated copies of the lines will then be added to a further staff. For shared carriers, make sure that in the table of line releases, both at the nodes, connected bars are released. Under the item "Downloads" (see below) you will find the example of a wood-concrete composite ceiling from  recalculated and the procedure as a video.